Albert Pinkham Ryder (American, 1847–1917), Moonlit Cove, early to mid-1880s. Oil on canvas, 14⅛ × 17⅛ in. (35.9 × 43.5 cm). The Phillips Collection, Washintgon, D.C.
14 ½ x 17 1/8 in. The theme of Moonlit Cove is imaginatively romantic, combining faithful representation of natural forms with an emphasis on the nocturnal effects of light. 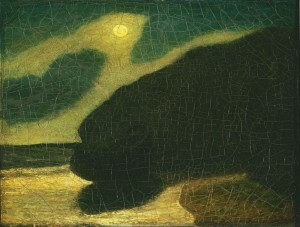 The simplicity of the composition suggests a random depiction of a scene found in nature, while the halo of the moon combined with the long cloud illuminating the cliff suggest a spiritual presence and the boat—now almost completely obscured due to the painting’s age and condition—suggests a human presence. Moonlit Cove dates to around the mid-point in Ryder’s career. It retains the simple and bold massing of form typical of his work of the 1870s and early 1880s, while also looking forward to the dramatic abstractions of his works from the 1890s and later. Walter Pach, “On Albert P. Ryder,” Scribner’s Magazine 49 (January 1911), 127. Morten also lent works by the French painters Gustave Courbet, Honoré Daumier, and Edgar Degas, and by the American Impressionist Theodore Robinson. Duncan Phillips, “Albert Ryder,” The American Magazine of Art 7 (August 1916), 391.